About the Artist . . . I have been working with clay for over 30 years. The longer I work with clay the more I love it. My work always involves exploration. The themes I am perpetually fascinated with explore myths and ritual through time and across cultures. Nature is also an infinite source of inspiration. I work on the wheel and also do hand building. Much of my work is a combination of the two. Over the past fifteen years I have been Raku firing most of my work. A number of years ago I started to do electric firing as well in order to get the true, brilliant colors that are possible only this way. I take the opportunity to create a cremation urn for someone as something very special. If you have other ideas you would like to explore in creating a uniquely personal piece please contact me. Thank you for exploring Urns Through Time. About the Urns . . . Ceramic Burial Urns have been used for millennia to hold the remains of loved ones. 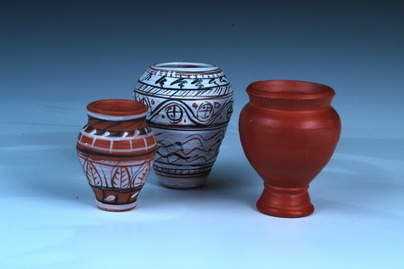 Some of the oldest ceramic works in existence are funerary vessels from Asia, Europe, Africa and the Americas. This rich and ancient tradition has left us a legacy of amazing vessels to turn to for inspiration. Urns Through Time offers a source for varied and eclectic ceramic urns that draw on these resources in developing ideas for original pieces. 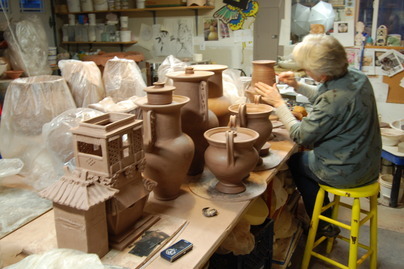 Each urn is individually and mindfully handcrafted with the intent of creating a meaningful memorial vessel. Hopefully these urns provide a shared sense of connection for our universal experience. This site will continue to grow and expand as a source for handmade funerary urns. It will continue to grow and expand also as a source for visual and written information on the history of ceramic funerary ware through time and across cultures. Q: What did you have created? A: A custom two person urn for my wife and I. Should we pass at different times, one shall wait for the other where we could be rejoined and buried together. Q: Why did you decide to have a custom urn created? A: It is our way of ensuring that our final wishes are respected. Also should one of us pass it remains as one less thing for the greiving survivor to worry about and have ready. A: From the moment I had interest in having my urn created I was amazed at how personal the process was. My ideas were brought to life by a professional artist in multiple different layout sketches based on our theme and choice in urn style. The sketches some based entirely on our ideas and others were variations created by the artist's imagination, which simply amazed us. Going through the sketches one in perticular jumped off the pages at us at being exactly what we wanted. The artist ran with the idea and our chosen color scheme to provide a beutiful design. Working with the artist we chose the best color to match our desires and still have a peaceful flow. And so the fire-ring began and we expected that to be the last heard/seen of the urn and artist until completed. However it was not the case as we were kept in the process by receiving emails containing photos of progress. It added to the whole being able to see the steps of our urn in creation and knowing that Urns Through Time cared about it's customers. We always thought it may be a morbid idea to have our own urn created but we are so pleased with the outcome that until the sad day we must use it, the urn is the center piece on the mantle. To the Urns Through Time staff, here's hopping we no longer require your service but we have enjoyed the experience working on this project with you and would recommend you to everyone.